This is a simple mod manager for DiRT Rally. The intent is to make it as easy as possible for everyone to use. Ryders Language editor for editing the DiRT3 language database to modify or add names to cars/teams/locations etc. Ryders EGO Database Editor for editing EGO Engine (DiRT, Grid and Formula 1 series) databases to add or modify cars/events/liveries etc. 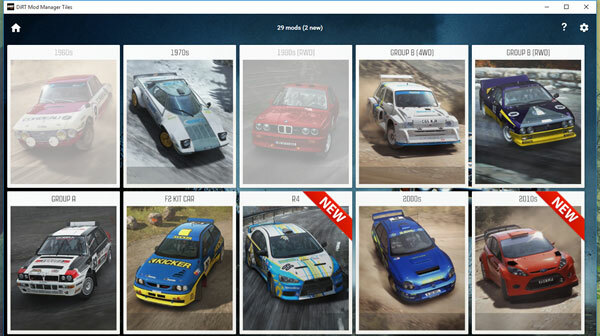 Ryders EGO PSSG Editor for unpacking and re-packing EGO Engine games (DiRT, Grid and Formula 1 series) liveries from .pssg files. Benny's Modder Tool for editing Database .xml files and easily adding liveries to the database.